With no one signed up to address any issues related to the 2019 fiscal year budget or millage rates, the Sarasota County commissioners voted unanimously on Sept. 27 to approve the overall budget of $1,242,441,007. It is the largest county budget since the 2015 fiscal year, according to a chart staff prepared for the board. 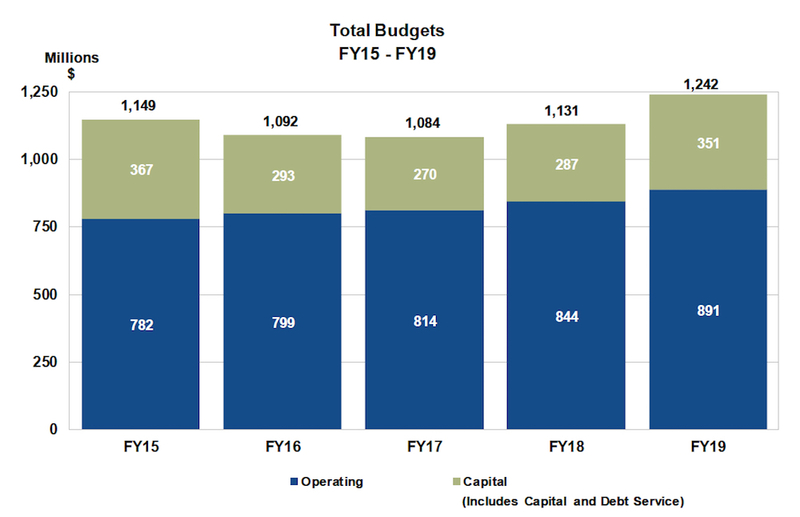 Of the past several fiscal years, the second-biggest budget was in FY15; its total was close to $1.15 billion. As County Administrator Jonathan Lewis noted t at the outset of the final hearing, which was held in Venice, no changes had been made in the budget since the board gave tentative approval to it on a 5-0 vote on Sept. 12. During the Sept. 27 public hearing, Commissioner Charles Hines was not present. Chair Nancy Detert offered no reason for his absence. The countywide millage rate will remain at 3.3912 mills for the new fiscal year, which began on Oct. 1. The last increase in the millage rate, Lewis noted said the Sept. 12 public hearing, was in 2013, and that was an adjustment for the Mosquito Control District. The general operating millage of 3.2140 represents a 5.07% increase of the rolled-back rate of 3.0589, according to a document provided to the commission in preparation for the Sept. 12 public hearing. 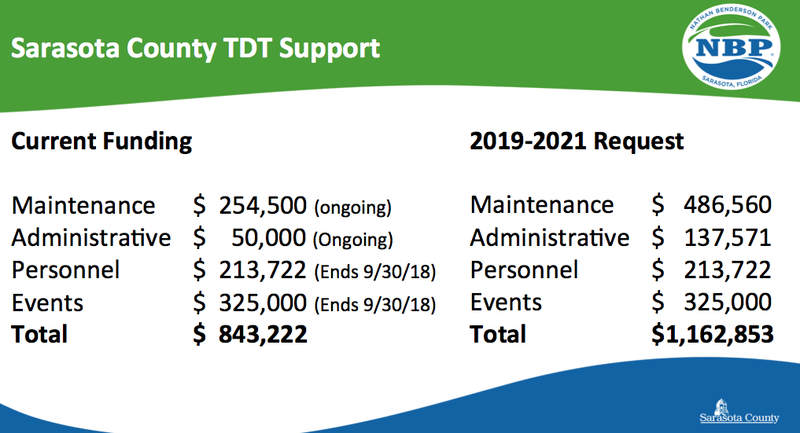 The “rolled-back” rater reflects what the rate would have been if the county were adjusting the millage so it would bring in the same amount of revenue for the 2019 fiscal year as id did in the current fiscal year. The value of county property rose 7.36%, Deputy County Administrator and Chief Financial Management Officer Steve Botelho pointed out to the board during its last workshop on the FY19 budget, held Aug. 22. Therefore, property owners whose values climbed will pay more in ad valorem taxes. A chart Lewis presented during the Sept. 27 hearing showed the budget includes funding allocations the board earlier approved to settle a dispute with the City of Sarasota over a final payment to the Downtown Sarasota Community Redevelopment Area (CRA) Trust Fund ($2,632,126.13); three years of assistance — $881,682 per year — to the city to help it take over management of five parks that had been under county control; $3,246,953 to make necessary improvements to Ed Smith Stadium, as provided for by a Memorandum of Understanding with the Baltimore Orioles; and extra funds the commission agreed to in June to help shore up the finances of the Suncoast Aquatic Nature Center Associates (SANCA). The latter nonprofit organization manages Nathan Benderson Park. As part of its approval of its Sept. 11 Consent Agenda of routine business items, the commission formally agreed to reimburse SANCA up to $486,560 for the costs of routine maintenance at the park and up to $137,571 for general administrative and operating expenses, all during the 2019 fiscal year. Additionally, the county will reimburse SANCA for up to $213,722 for personnel expenses and up to $325,000 for events at Benderson Park for FY19, according to a Sept. 11 memo in which Carolyn Brown, director of the county’s Parks, Recreation and Natural Resources Department, summed up the decisions the board made on June 20. SANCA CEO Stephen Rodriguez had outlined SANCA’s expected financial shortfalls in letters dated Feb. 28 and April 6, requesting changes in the board’s agreement with the nonprofit, Brown added in the memo. Rodriguez then addressed the board on June 20 to make his case for the extra support. The additional funds will come out of county Tourist Development Tax revenue set aside for SANCA. That revenue is derived from a 5% tax on rentals of accommodations in the county for less than six months at a time. Among other facets of the FY19 budget, Lewis noted that roadway resurfacing expenditures will remain at $10 million per year, as part of the approximately $178.4 million budgeted in the county’s Capital Improvement Program; merit pay increases will be provided for county employees who are not members of unions; and contractual raises will be accorded to bargaining staff members. Altogether, Lewis pointed out, the Capital Improvement Program for the 2019 fiscal year will encompass 89 specific projects. The only person to appear before the board on Sept. 27 was Fletcher Rush, a member of the Library Foundation for Sarasota County and its Community Advocacy Team. An attorney with The Farr Law Firm, Rush noted that the foundation was able to provide the county an additional $212,000 for the purchase of e-books and audio books for its collection in the 2019 fiscal year. 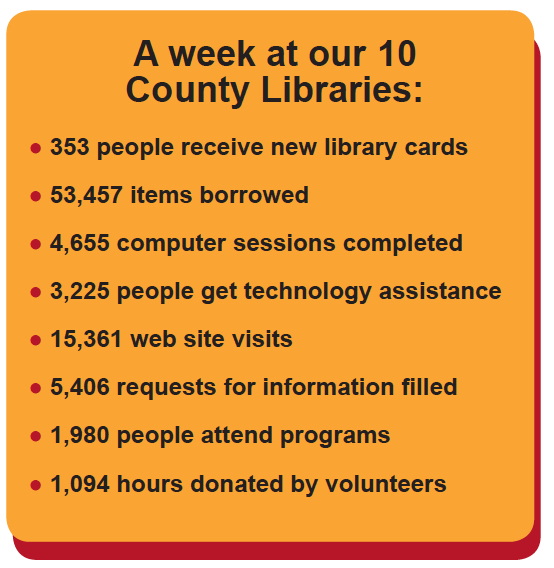 He also thanked the commissioners for talking with representatives of the Community Advocacy Team and, especially, for deciding not to close the public libraries an additional day of the week to save money. 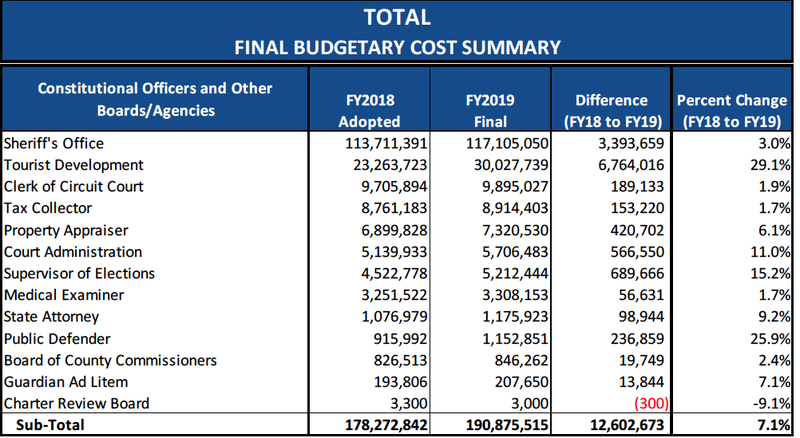 In late January, the commissioners addressed a number of measures that would enable them to balance the FY19 budget without a millage rate increase and lead to lower budget expenses in coming years. With the libraries already closed on Sundays — action taken because of funding shortfalls in the Great Recession — Community Advocacy Team members urged the board not to close the facilities on Mondays, as well.